The concept of charts has come in existence to summarize the trading action for a certain time-frame. 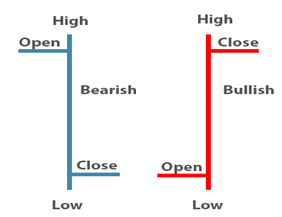 Each trading has mainly four data points: Open (O), high (H), low (L), and close (C). We will denote these four data points with OHLC, commonly known as technical chart pattern. 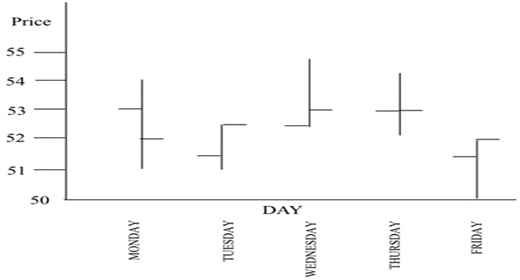 If we want to look at the trading action of a stock for a week, each day will have four data points and hence there will 28 (4 data point x 7 days) data points. Similarly, we can draw a technical chart for the trading action of a stock for the whole day, mentioning the four data points for each hour of the day. Hence you can get understanding how complicated it would be, when we will try to summarize the trading action of a stock for a month, six months or a year. In previous chapter, we learnt about what is technical analysis through examples. In this chapter, we will explain how to look at a technical chart patterns and why traders use different charts. Now you have got that why traders use the charts to summarize the trading action of a stock, but each and every chart cannot be used for the purpose. Various general charts such as pie chart, column chart, and area chart may not be useful for technical analysis because it requires four data points at same time but these charts express only one data at a time. In this chapter, we will give you a brief explanation of above mentioned charts and will also let you which chart is more preferred by traders. A line chart consists of various data points (one data point at a time) that are connected by a line. Generally, it’s used to show the closing price of a stock for the day or the week. In a line chart, each closing price is shown by a dot and the dots are connected to create a line. Let us take a line chart example to understand the concept with a line chart for the closing prices of a NIFTY. Here, the above line chart shows the closing prices of a NIFTY from June to Decemeber. The technical chart shows the fluctuations the closing prices of the nifty index at different days. We can see the highest closing price for the nifty was close to Rs.8,633.50 on 22th of July while the lowest closing price for the nifty was close to Rs.7,558.80 on 7th September. The main advantage of this technical chart is its simplicity. You can easily observe what the highest closing price was, what the lowest closing price was and how did it fluctuate throughout the time period. However, the chart isn’t much commonly used by traders as it doesn’t show any information except the closing price of a stock. Central Line: The top of the central line shows the highest price of a stock and the bottom of the central line shows the lowest price of a stock. Left Mark / Tick: The left tick on the central line shows the opening price of a stock. Right Mark / Tick: The right tick on the central line shows the closing price of a stock. Let us a bar chart example to understand the concept with a bar chart for the OHLC data of a stock. In the above bar, we can see five bars showing the OHLC data of a stock for Monday to Friday. On Monday, we can see the lowest price is Rs.51 and the highest price is Rs.54. The opening price of the stock is Rs.53 and the closing price of the stock is Rs.52. Let us further understand about what the bearish and bullish bar charts are. In a bearish bar, the opening price of a stock is always higher than the closing price of the stock. We can see that the bar chart Monday is a bearish bar because the opening price of the stock (Rs.53) is greater the closing price of the stock (Rs.52). In a bullish bar, the closing price of a stock is always higher than the opening price of the stock. We can see that the bar chart Tuesday is a bullish bar because the closing price of the stock (Rs.52.50) is greater the opening price of the stock (Rs.51.50). But a bar chart also has its disadvantage. It’s little difficult to spot the potential pattern developing for a stock. And hence the traders don’t use this technical chart frequently. Traders prefer to use a candlestick chart to get the potential pattern of a stock. In next chapter, we will discuss why they do so. » Currently Reading: Technical Analysis: Types of Technical Chart Patterns.